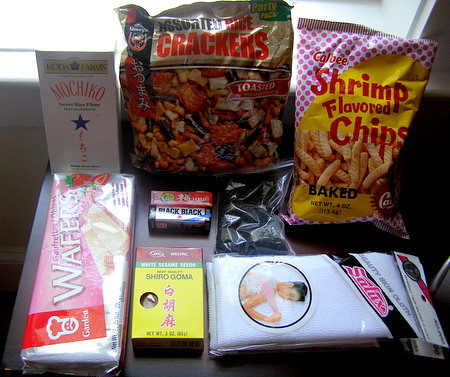 I finally worked up the nerve to place an order with Asian Food Grocer (AFG). 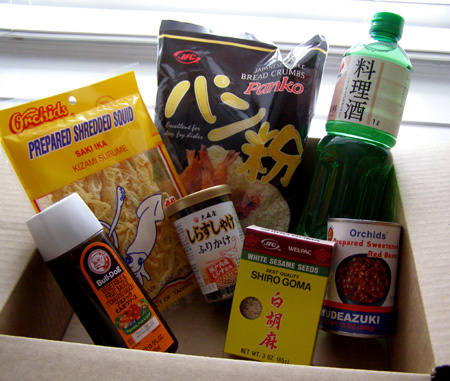 I’ve never ordered imported food online before, and didn’t know what to expect; that said, I’m now sold on the idea. I placed the order on Christmas, and received it Monday, January 5th, at 8:30 am. 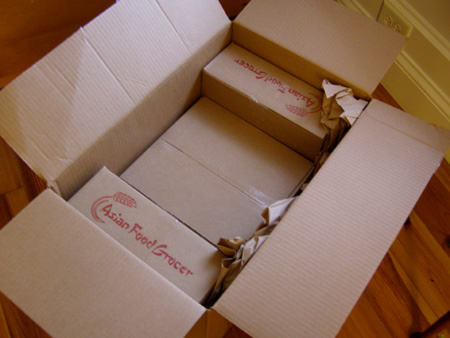 They used cardboard & kraft paper for packaging, which was effective & neat. 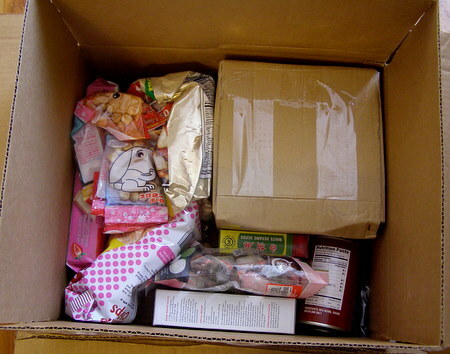 Everything arrived intact, and more surprisingly, in pristine condition. I’m so used to grocery store imports, battered & dust-covered & occasionally slick with greasy film, that the fresh, clean bags & bottles made me ooh and aah. The prices are great, though not the absolute best (e.g., a 1.41 oz box of Pocky costs $1.08 at AFG versus $0.99 at Koamart). They offer FedEx and USPS shipping options; I chose FedEx and paid just over $18 to ship this order, which isn’t unusual. 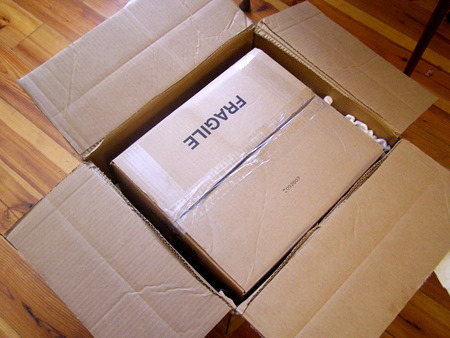 The shipping fee also gets more reasonable as the order size increases. Summary: AFG features quick shipping (given the holidays), low prices, and nice-looking products. They also add English language nutrition labels to all imports, a nice touch. Highly recommended. And, because I’m excited & want to share, below is an overview of what I bought. 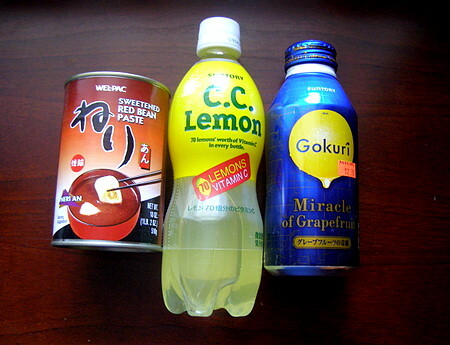 You’ll notice that AFG sells Japanese products almost exclusively; I may try Koamart next to fill in the blanks. 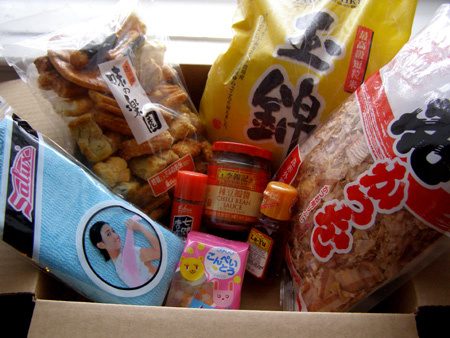 Clockwise, starting at the far left corner: Salux wash cloth, ajino rakuen rice crackers, small grain rice, bonito flakes, La-Yu chili oil, chili bean sauce, shichimi togarashi, Puchirin Konpeito (sugar candy). I’ve heard great things about Salux wash cloths, so threw one in the cart. Small grain rice, shichimi togarashi, chili bean sauce, chili oil & bonito flakes pop up in all the Japanese cookbooks I own, so in they went too. 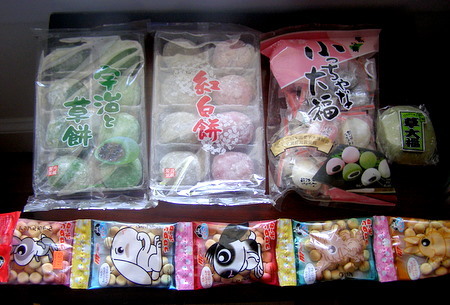 The sugar candy had great reviews, but more importantly, resembled the space candy in Nodame Cantabile (right). The rice crackers, though, have a brutal aftertaste. I nearly cried the second time I tried one, and I’m not a picky eater. I’ll give them one more go before posting a review/pawning them off on an unsuspecting friend. 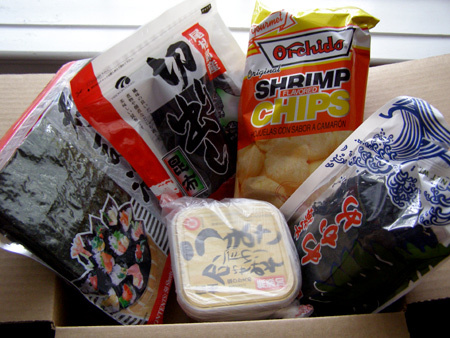 Clockwise from far left: Roasted bulk sushi nori, hirikon kiridashi kombu, shrimp chips, wakame, awase miso. More basics: miso and three kinds of seaweed (nori for sushi & rice balls, wakame for soups & toppings, & kombu for dashi). As for the miso, AFG calls it red miso, but the full title says “awase miso,” which I thought was a blend of white & red. We shall see. I discovered shrimp chips in Paris, and lived on them for a month thereafter. These are made in America & quite good. Clockwise from far left: Bull-Dog tonkatsu sauce, prepared shredded squid, panko bread crumbs, ryorishu mirin, prepared sweetened red beans, white sesame seeds, salmon furikake. 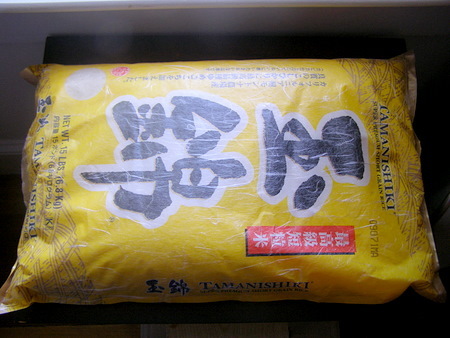 Since we like tonkatsu, I bought panko & tonkatsu sauce (Bull-Dog is the brand that always gets recommended). Dried squid is both disgusting & addictive, and perfect with beer. Mirin & sesame seeds were two other cooking basics I needed, plus the sesame seeds were half the cost of my local grocer’s. Ordering the mirin gave me a lot of trouble, however; some people advised aji mirin, most suggested hon or “regular” mirin, and in the end I just went with the one with the highest alcohol content (13%). Adding to the confusion, this kind is called “ryorishu mirin,” which is like saying “wine alcohol” (at least, that’s what this glossary suggests). Again, we will see. I’ve wanted to try furikake since reading Shiawase Kissa Sanchome (the heroine lives on her own for the first time, and instead of cooking real meals, makes rice seasoned with increasingly bizarre types of furikake). The prepared red beans are for tau sar bao; I haven’t found red bean paste anywhere, so hopefully I can strain this and get something similar. As for the dough, I’ve heard that Pillsbury biscuit dough is a good shortcut. We will see, we will see.